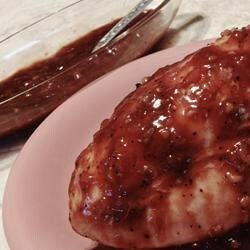 "Oven barbequed chicken over mesquite chips, right in your own oven! For added spice, try adding your favorite type of chili pepper when making the sauce." Place wood chips in warm water, and soak for 2 to 3 hours. In a small saucepan, blend the ketchup, brown sugar, beer, vinegar, and wine. Mix in the onion, bell pepper, and black pepper. Simmer until thickened, approximately 10 minutes. Spread wet wood chips evenly in the bottom of a broiler pan, adding enough water to ensure chips remain moist while cooking. Cover with broiler pan grate, and arrange chicken pieces on top. Coat chicken with the sauce, and cook approximately 1 hour, basting regularly. I found this very tasty, and I think the sauce would be good with pork as well. Thanks. This BBQ sauce is AWESOME! I cut back a little on the brown sugar as I was afraid it would be too sweet. It was just perfect with half. Liked the flavor of the hickory wood chips but sauce never thickened and guest commented on strong vinegar flavor. Sauce never thickened, so I added a thickening agent (pre-blended cornstarch and some of the broth) and it worked like a charm. Thanks!